Posted on October 21, 2013 | 4309 views | Topic : Property News. For safety of residents: MBPJ has embarked on hill strengthening works in Jalan 5/64. The project should be completed within eight months. THE Petaling Jaya City Council may have to spend RM50mil to strengthen several hillslopes in Bukit Gasing if the individual landowners fail to fulfil their responsibility. Councillor Derek Fernandez pointed out the owners were legally responsible to ensure their land was well maintained. “There are about 37 plots of land here. “The state should seize the land of irresponsible owners if they fail to look after the slopes on their properties,” he said during a visit to Jalan 5/64 in Section 5, Petaling Jaya. 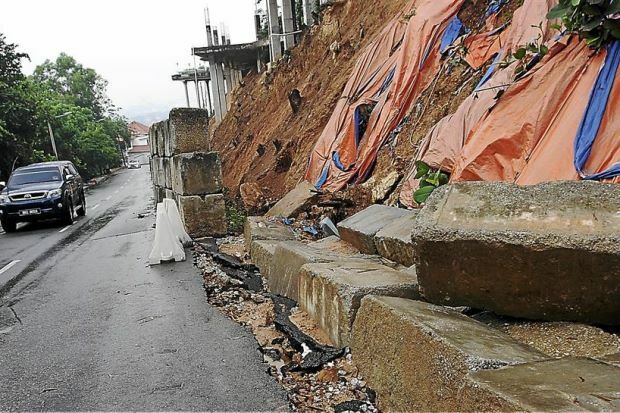 MBPJ has appointed contractors to strengthen two hill slopes in Jalan 5/64 and Jalan 5/66 following several landslides and soil erosion in the areas. It is estimated that the works will cost RM4.5mil and RM8mil respectively. The hill strengthening work in Jalan 5/64 will be completed by June next year. Meanwhile, the council has banned all major development, termed Class Three and Four, in the neighbourhood to prevent further soil erosion and landslides. A landslide on May 5 in Jalan 5/64 uprooted trees, damaged several cars and cut off access to the area. Bukit Gasing assemblyman Rajiv Rishyakaran commended the council for the pro-active measures taken. He said he would raise at state-level the issue of seizing the privately-owned land. “MBPJ should not have to strengthen these hillslopes using public funds. “However, it is necessary to ensure the safety of those living and visiting the Bukit Gasing recreational area,” he said. The poor hillslope condition has also resulted in clogged drains. The hill strengthening works in Jalan 5/64 uses the “soil nailing” technique over 2,300sqm of land.